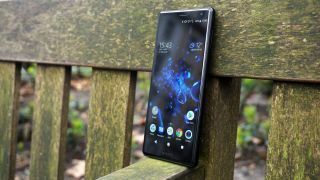 The Sony Xperia XZ2 hasn’t been out long, but in typical Sony fashion a new flagship could be on the way very soon, and may have just been caught on camera, complete with a dual-lens camera but an otherwise very familiar design. The Sony Xperia XZ3, as it’s likely to be called, includes a tall, likely 18:9 display with a large bezel above it in these pictures, which were obtained by Sumahoinfo. We assume there’s also a sizeable bezel below, just like on the Xperia XZ2, but the bottom edge isn’t pictured. There’s a speaker and single-lens camera in the top bezel, power and volume buttons on the right edge, and the back appears to be made of glass and slightly curved. So far, so Sony Xperia XZ2. Really, the only obvious design detail that reveals this isn’t Sony’s current flagship is the aforementioned dual-lens camera, which makes it look more like the Sony Xperia XZ2 Premium (though the lenses here look different). It’s arranged vertically and is quite low down on the back of the handset, with a fingerprint scanner set below it. We complained about the awkwardly low position of the scanner on the Xperia XZ2 and it looks like that’s been maintained here. That is, if these pictures are the real deal, but they could easily by Photoshopped shots of the Sony Xperia XZ2, so we wouldn’t read too much into them just yet. If Sony does plan to launch the Xperia XZ3 soonish though then we’d expect to see plenty more leaks soon.